We’re nearing the end of 2018 and that means it’s time to judge the best of things. Our researchers and reviewers did an excellent job with the Best of Android 2018 for smartphones. However, there are still two more major categories that still need judgment. They include Android apps and Android games. We don’t have a super scientific method of measuring apps. Different apps do different things and appeal to different people, after all. Thus, we couldn’t immediately figure out a way to determine the very best Android apps. Instead, we’re going to ask you! The apps (or services) are from 2018 or at least the last few weeks of 2017. We cut off the wait time in early December every year. The developers had to update the app at least a few times to overcome new app bug problems. We do not include apps that received substantial updates, re-branding, or ownership changes. There are exceptions for apps with redesigns so huge that it no longer looks or feels like its previous version. In other words, Smart Launcher 5 makes the list, but Google Keep Notes with its name change and UI redesign does not. Okay, so this poll is massive so let’s get right to it. There aren’t any special rules or anything to take into consideration. Just vote for the one you like the most! We have some basic descriptions and links for each app under the poll in case you want to see what they do. Bouncer – Bouncer is a security app. It lets users grant temporary access to permissions to apps and the app revokes those permissions later. For instance, you can give Facebook temporary permission to access your location and then set Bouncer to remove that permission later. Cake Web Browser – Cake Web Browser is a slightly different approach to web browsers. It lets you search for various things and then you swipe between the search results like Tinder. It also comes with an RSS feed, a pop-up blocker, an ad-blocker, Slices (a news section), and more. Carrot Weather – Carrot Weather is a decent weather app with a few fun, unique features. The app comes with weather basics like forecasts and current weather. You also get sassy quotes and a neat time travel feature. The time travel feature let you view the weather up to 70 years in the past. Dolphin Emulator – Dolphin Emulator isn’t technically new. However, it was re-launched after years of abandonment. It’s the only somewhat decent emulator for GameCube and Nintendo Wii. The new versions fixed a lot of bugs and added some new features. Moral gray area aside, this is a welcome addition to the emulator scene on Google Play. Dolphin Emulator has nothing to do with Dolphin Browser. Firefox Reality Browser – Firefox Reality Browser is a virtual reality browser for Google Daydream and other virtual reality headsets. It supports both 2D and 3D content and adds some much needed competition in the space. Of course, it needs more work, but VR is still fairly new. Forest – Forest is a productivity app with similar ideas to Google’s Digital Wellbeing. You open the app and a tree starts to grow. If you leave the app to check Facebook or do other distracting things, your tree wilts. The goal is to keep you off of your phone while you work. It’s also configurable with a whitelist so you can still answer important texts or phone calls. Grammarly Keyboard – Grammarly Keyboard is the best new keyboard of 2018. It doesn’t have a ton of flashy features like many of its competitors. However, it actively corrects your grammar as you type. It also explains its corrections. We expect more flashy features like gesture typing in future updates. Haven – Haven is a niche security app. It’s an open source app that helps protect your stuff. You install it on a secondary device and put that device in your belongings. The app alerts you on your primary phone when your secondary device is moved, picked up, or otherwise messed with. It’s not useful for everybody, but it’s a really neat idea for frequent travelers. Heimdall Parental Control – Heimdall Parental Control is what the name implies. You install it on your device and your child’s device. You can then control their device from yours. That includes limiting app and phone call time, tracking your child’s network activities, and the premium version has phone tracking as well. Hyperion Launcher – Hyperion Launcher is the next big app from the developers of Substratum. It features a stock-style look, tons of customization options, and an optional Google Feed plug-in for fans of that. You also get third party icon pack support and tons of theming options. It’s surprisingly good for how new it is. Khan Academy Kids – The regular Khan Academy is one of the best educational apps on Android. Khan Academy Kids fills a similar role for kids’ learning apps. The app covers reading, literacy, math, logic, memory, and problem-solving. It’s also entirely free with no ads or in-app purchases. What’s not to like? Kiwi Browser – Kiwi Browser is another new browser from 2018. It’s based on WebKit and Chromium for a relatively smooth experience. You also get a strong ad-blocker, crypto-jacking protection, and a minimal-style UI for quick browsing and content enjoyment. It also supports 60 languages. Lean Launcher – Lean Launcher is the friendliest launcher release for fans of minimalism. It has a stock Android look along with a few decent security and customization features. You can hide icons from your app drawer, change the theme, and use gesture controls. We didn’t love it as much as we loved some other launchers on the list, but it’s still really good for what it does. Navigation Gestures – Navigation Gestures adds gesture controls to basically any smartphone. You can configure basically any gesture you can think of, including taps, swipes, and swiping from different parts of the screen. Those gestures can trigger all kinds of actions with more available in the premium version. It needs work, but it worked well in our testing. Opera Touch – Opera Touch is another new mobile browser from Opera. It features desirable features like an ad-block, a QR code scanner, and a bunch of little usability features. It doesn’t sync with the PC version and we definitely think it should. However, it’s otherwise a very functional web browser from a big name in the space. Poco Launcher – How did an OEM launcher make this list? Well, because it’s actually pretty good. Poco Launcher is a lightweight launcher with enough usability and security features to delight us. That includes home screen customizations, categorical app sorting, and you can hide apps from the app drawer. Not bad, Xiaomi, not bad at all. ProtonVPN – ProtonVPN is our favorite new VPN from 2018. It gets the basics right. That means no logs, good encryption, and a home base in a neutral country (Switzerland). It has a bona fide unlimited free version, albeit at slower speeds. The subscription prices aren’t half bad either. It was a shoo-in for our best VPN apps list. RememBear – RememBear is a new password manager from TunnelBear, developers of the popular eponymous VPN service. It had some issues on the onset, but it’s quickly becoming a positive force in the password manager space. It even has most of the desirable features that many other password managers have. 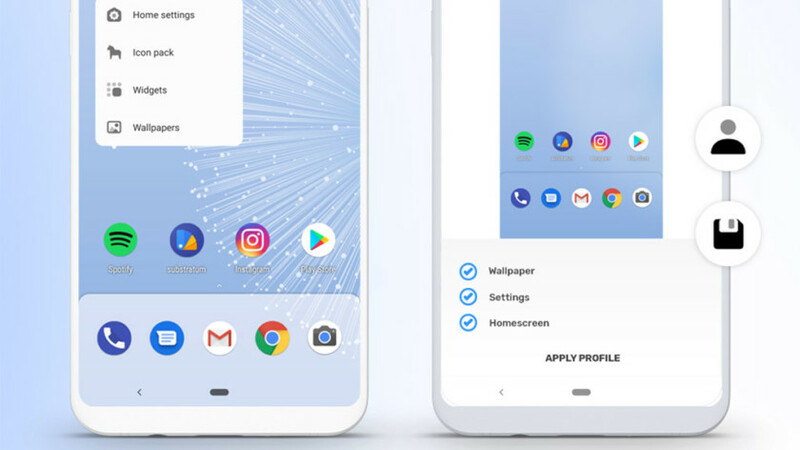 Smart Launcher 5 – Smart Launcher 5 was a massive departure from previous versions of the launcher. This new version features adaptive icons, theming, app sorting, an ultra-immersive mode, gestures, and other customization features. It even has an integrated app locker and that kills two birds with one stone for security fans. YouTube Music – We debated internally whether or not to include this because it’s technically just a huge update. However, it’s about the only big new music service in 2018. We loved its integration with music videos along with streamed music in our initial impressions video. It should get much better over time with the possible exception of its actual music quality. There were plenty of great apps from 2018 and if we forgot one, tell us about it in the comments after voting for Other so that we can count votes for your favorite apps as well!